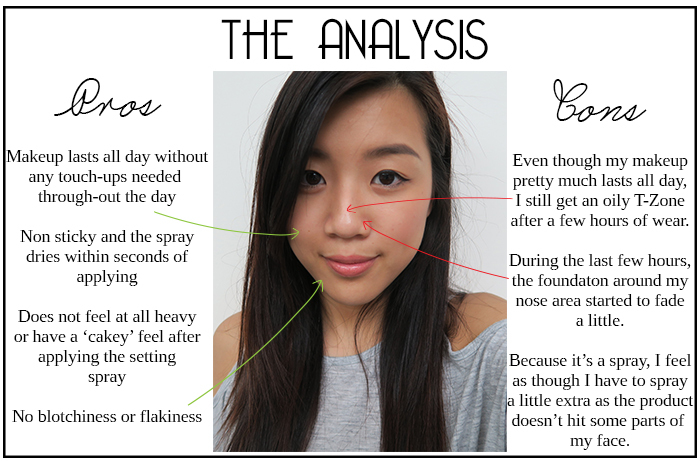 I’ve been trying out the Urban Decay All Nighter Setting Spray for a while now and as the weather is getting hotter here in the UK; it really has put this product to the test! I’ve decided to take a photo of myself after 14 hours of applying the setting spray; I took this on a weekday in which I have to endure 9 hours of work on a sweaty day. Please note that I did no apply any concealer under my eyes (sorry for the eye-bags) or on any blemishes nor did I apply any translucent powder on before spraying the setting spray. My weekday makeup face consists of; primer, foundation, blush, mascara, eyeliner and eyebrows. I have actually become quite addicted to this product, I personally feel that my makeup does last longer than before, and even though I still have an oily T-zone after a few hours of applying, it still does the job. This may also be caused by my skin type as it does tend to become more oiler during the summer. It has actually became a routine of mine to spritz my face before leaving the house or I feel that something is missing. If you guys are not that all convinced that this product is for you but you still want to give it a go; you can also purchase the travel size bottle for £9. I have been using this product for 4 months now on a daily basis and it about 3/4 gone – I personally feel it is lasting quite a while. What’s your beauty must have? I just bought the travel size because I wasn't sure about it, it's great to hear it's good! I just finished the travel size and loved it. It actually took me around like half a year to finish it and for its great price its totally worth it! I think they also came out with another version which is supposed to have a chill effect which is great for summer months.